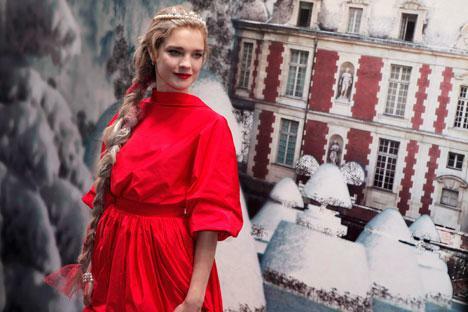 Russia’s models have taken the fashion business by storm over the last decade, with Russians signing contracts with some of the biggest names in the industry and the likes of Natalia Vodianova and Irina Kulikova becoming the faces of perfumes. RBTH presents a guide to seven of the biggest stars on Russia’s modeling scene. A mother of four, Natalia Vodianova is not just the most famous Russian model, but also a prominent philanthropist, advocating for the rights of children with special needs. She is married to Antoine Arnault, son of LMVH founder Bernard Arnault. Neither her status as a mother nor her charity work interfere with Vodianova's successful career: she became the face of Calvin Klein's Euphoria fragrance in 2015 – 10 years after signing her first contract with the brand. Born in 1986 in the city of Nizhny Novgorod, Anne Vyalitsyna began her career at the age of 15, signing a contract with IMG Models and moving to New York. She cooperated with Anna Molinari, Chloé and Sportmax. She has appeared on the covers of Vogue, Elle and Glamour, and has worked for numerous fashion houses, including Shiatzy Chen, Chanel, Prada, Louis Vuitton and Dolce & Gabbana. Born Natalya Polevshchikova in Perm in 1985, she made her debut in 2004 walking for Emanuel Ungaro, which earned her second place at the New Model Today contest and a contract with the Why Not model agency. Poly is one of the most famous models in the world, and her Instagram account has over 400,000 followers. Throughout the years, she has worked as the face of many brands, including Lanvin, Fendi, Marc Jacobs, Michael Kors, H&M and others. A history student at the Russian State University for Humanities, Pivovarova became a model by chance after her friend and future husband Igor Vishnyakov sent some photos of her to IMG Models in 2005. Her first runway show was for Prada, and the brand then signed a three-year contract with her. She has since appeared on the covers of various international editions of Vogue numerous times (with seven appearances in total for the Italian edition), also modeling for a Pirelli calendar and participating in various advertising campaigns from Giorgio Armani to Chanel. In 2011, she made her acting debut in the science-fiction film In Time; the same year, she also created a sleepwear collection for Gap. A favorite of Mark Jacobs and John Galliano, Irina Kulikova was born in 1991 in the town of Slobodskoi in the Kirov Region. She became a professional model in 2007. After signing with IMG Models, she moved to New York. Her first shows were for Prada and Calvin Klein. She has cooperated with some of the most famous American designers and became the face of the Marc Jacobs perfume Daisy. Yekaterina “Kate” Grigorieva was born in 1989. She graduated from the Murmansk State Technical University, majoring in marketing. She has competed for the title of Miss Russia twice, but did not do particularly well. However, she later finished runner-up on the Russia's Next Top Model TV show. Soon after, she signed a contract with a major agency and moved to New York. In 2014, she modeled for Donna Karan, Oscar de la Renta, Tory Burch and Ralph Lauren. In 2015, Grigorieva became one of the 10 new Victoria's Secret Angels. Alexandra “Sasha” Luss made her debut in 2008, walking for Alena Akhmadulina during Moscow Fashion Week. Later that year, she also appeared on the covers of Vogue Russian and L'Officiel Russia. Signing a contract with clothing brand DNA, she moved to New York, but before long she came back to Russia. In 2011, she signed with several agencies and got noticed by Karl Lagerfeld. After several shows for Chanel in 2012, her career finally gathered pace: She took part in 58 runway shows in the fall/winter 2013 season, signed advertising contracts with Carolina Herrera, Max Mara, Valentino and Tommy Hilfiger, and appeared on numerous magazine covers and in one Pirelli calendar. First published in Russian by Gazeta.ru.